Intermediates, Beginners, Snowboarders and Apres-Ski! Haute - Nendaz and it's small satellite Siviez are modern resorts offering mostly family orientated appartment accommodation. It does offer the fastest access route to the Mont-Fort, top of the ski area 4 Vallées. When will it snow in Nendaz? The next notable snow forecast for Nendaz is 2cm1in, expected on 24 April, with around 36cm14in forecast over the next 7 days. The Swiss Ski Resort of Nendaz is part of the Four Valleys ski area with access to 412km256 miles of downhill skiing, with 205 marked pistes, served by a total of 92 ski lifts. In addition to the skiing in Nendaz itself (70km43 miles of pisted ski runs), the appropriate ski Lift Pass will allow you to ski or snowboard in the other Four Valleys ski resorts of Bruson, Evolène, La Tzoumaz, Siviez, Thyon les Collons, Verbier and Veysonnaz. Nendaz is directly linked by Ski Lift to the ski areas of Siviez. With ski lifts as high as 3,300m10,827ft, skiing and snowboarding is assured throughout the season. Haute - Nendaz and it's small satellite Siviez are modern resorts offering mostly family orientated apartment accommodation. It does offer the fastest access route to the Mont-Fort, top of the ski area 4 Vallées. The longest possible descent in Nendaz is 15km9 miles long. Nendaz offers good sking, particularly, for Intermediate and Beginner skiers. Closes : April 28, 2019. Usual opening is early December, and usual closing is Late April. NOTE:- Lift and Piste openings are always subject to Snow Conditions in Nendaz. Nendaz is able to make snow, with 22 snow cannons. The 20 ski lifts of Nendaz are able to uplift 25,000 skiers and snowboarders every hour. Nendaz is in the Swiss Alps in Four Valleys, Valais, Switzerland. The nearest airports to Nendaz are Sion, Geneva and Berne. There are nine airports within three hours drive. Sion is just one hours drive away, in good driving conditions, so you can be on the piste quickly. Want to Know when it Snows in Nendaz? 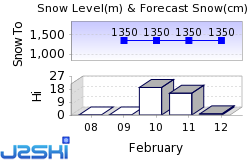 Click above to get Snow Reports by e-Mail for Nendaz. By doing so, you agree to Our Rules. Other popular Ski Areas near Nendaz. Ski Hire Shops in Nendaz. For current snow conditions, see our Nendaz Snow Report. Want to ask about skiing and snowboarding in Nendaz? Or contact Nendaz Tourist Office. Note :- The information on J2Ski concerning Nendaz, where not clearly factual, is opinion only and is neither definitive or exhaustive. Warning :- Snow Sports are Dangerous! Skiing, snowboarding and all winter sports involve risk of serious injury or death. You MUST confirm all information, especially snow and weather conditions, in Nendaz before you ski or board. You participate at your own risk.